Greening your business has short-term effects that will save you money, let employees breathe better, and maybe even help land you a few more customers. These tips, sites, and kits can help your business go green for 2012. Starting off the new year with a vague eco-friendly resolution usually just leads to business as usual. Set goals for how much you can reasonably reduce your carbon footprint, and then get there by purposefully making changes in the products you buy and the energy you use. This business carbon footprint calculator can help establish your footprint. Going a step further, a business energy audit will lead to utility bill savings. Whether you have one company car or a fleet of delivery vehicles, make fuel efficiency a priority. You don’t have to buy a hybrid or a diesel car; the Department of Energy displays the most fuel-efficient vehicles in the country in each category on its website. And consider hooking employees up with memberships to by-the-hour car-sharing services such as Zipcar, which offers hybrids. No, a living wall doesn’t pulsate with chthonic forces and demand to be fed with brains. It's loaded up with plants that help clean up your indoor air quality, and they don’t have to cost a fortune. Home or small office versions can be found here starting at $450.00. If you’d rather not have a wall of plants, look at buying a few more plants to spread around the office to help you and your employees breathe easier. NASA-backed research shows that greenery removes toxic chemicals, including those found within computers and printers, from the air. 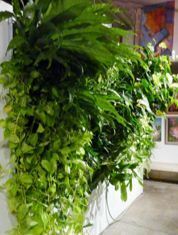 The most potent air-cleaning plants include the low-maintenance peace lily and English ivy. Before you make any purchases, particularly for high-volume items, look at the packaging and materials that go into the product. While everything you buy can’t be 100-percent organic or packaging-free, choose a product that's a bit more eco-friendly than its competition. The nonprofit EPEAT ratings mark laptops and desktops that conserve more energy and use fewer toxic materials than others. The quarterly Greenpeace Guide to Greener Electronics ranks the best practices of big tech brands. Consider undertaking a life cycle assessment for your own products or services to determine where you can make improvements. If you print brochures or other marketing collateral, try to go as green as you can with your printing choices. Check out these five green printing tools. If you need a third-party to print materials, Greenerprinter.com makes a commitment to the environment. Many tools allow employees to work from anywhere, and employers enjoy bottom-line benefits to telecommuting policies. GoToMeeting, Skype, Google+ Hangouts, and many other technologies let you meet with employees on the fly even if they are working in their slippers at home. The savings alone for in-person meetings where employees need to fly to a destination is 1600 kilograms of carbon emissions, according to the World Wildlife Fund. That's not to mention savings for your travel budget. Belkin's $10 Conserve Socket is a dead-simple power timer. If you want to turn all of your office equipment and lights off at the same time, you can do it with an INSTEON system. Put the on/off switch beside the office door to rest assured that lights, printers, and other items aren't silently sucking money out of your bottom line every night. Don’t put computers on this kind of system; follow the next tip instead. It's also worth investing in smarter power strips that reduce the standby power drained by gadgets that aren't in use. Belkin has a number of easy-to-use gizmos to help control the power demands of everday equipment. Every computer can be run in power-saving mode. In Windows 7, go into your control panel, and then choose Power Options and Power Saver, except where you really need your computer to run at peak performance. Your graphic designer, for example, may not want to run her computer on Power Saver mode. And if she's rocking an Apple, check out built-in power saving features for OS X. --Elsa Wenzel contributed to this story.